Group will start hiking at different times from Oandu, Kauksi, Ähijärve, Ikla, Penijõe and Peraküla and meet in Aegviidu at 25 August for a great hiking celebration. 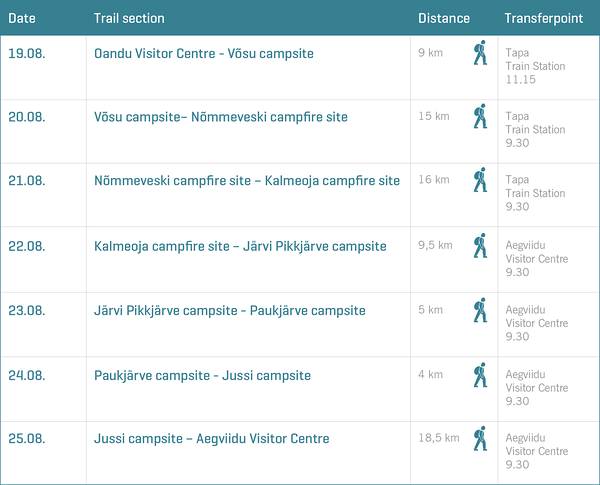 Pick a trail from the map to view detailed information. The journey from Peraküla to Aegviidu is 188 kilometres long and takes ten days. The hike starts from Peraküla, which has an ocean-like beach with singing sand. One of the most fascinating and also best-known sights on the trail is definitely Lake Rummu. The lake that emerged in a limestone quarry dug by prisoners hides several secrets and has become a popular place for swimming and diving. The guide on this branch is Tõnu Pihelgas. Tõnu is a well-known figure on the Estonian hiking scene and has also been the President of the Estonian Ramblers’ Association. Tõnu goes hiking on every possible occasion and has explored hiking trails both in Estonia and abroad. Tõnu’s constant cheerful disposition is contagious and it is impossible not to enjoy hiking with him. The hike from Oandu to Aegviidu begins from the Oandu Visitor Centre. The section is 77 kilometres long and takes seven days. This is one of the oldest long hiking trails in Estonia, also known as the Kõrve trail. What makes this hike unique is the fact that the entire trail is completed on foot. 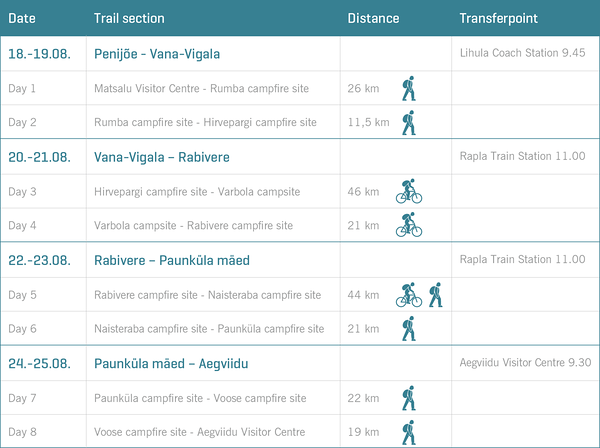 The trail passes countless sights, as it goes through Lahemaa National Park and the Kõrvemaa region, which was already a well-known hiking area in the first half of the 20th century, during the first Republic of Estonia. One of the most fascinating sights on the trail is definitely Jussi heath. This treeless heath covered in heather is somewhat similar to Scotland or the tundra in Lapland. The heath has emerged as the result of several fires caused by military exercises of the Soviet artillery. In the Soviet era, the place was used as a military training polygon. There are no fewer than two guides on this section. Tiina and Jaak Neljandik have been living and working in Lahemaa for a couple of decades already and know the region like the back of their hand. They are a lovely couple, supporting each other both in life and work. When Jaak’s mind goes wandering, Tiina will take over, and the other way around. Their shared love for hiking has also taken them from homeland forests to foreign lands. However, there is no place like home – this is something they both will agree with. Although Kauksi-Aegviidu isn't the easiest of trails, it surely offers fascinating experiences. The newly finished branch of the hiking route takes nature lovers through the exciting landscapes of Ida-Viru County, showing the region, which is otherwise considered to be periphery, from a totally new perspective. Every Estonian and probably also many foreigners know the Valaste waterfall and the limestone cliffs of Northern Estonia. The Agusalu kriivas are definitely among the most interesting natural sights on the trail. These are narrow ridges of ancient sand dunes, situated between mires and bogs, on which both people and wild animals can walk. It is still not clear how these dunes emerged. Are they coastal formations that emerged when Lake Peipus retreated or continental dunes formed by the freezing wind in the cold post-glacial desert? The best time to contemplate on this is while wearing a backpack and hiking boots. The guide on the Kauksi-Aegviidu section is Andre Kaur. Andre is an experienced hiker and a true nature enthusiast who knows all there is to know about nature. He has hiked through every metre of the existing trails of the RMK hiking route and has also been closely connected to the creation of the new branch. It is no exaggeration to say that Andre has spent the days and months of the past year in the forests of Ida-Viru County, looking for the perfect path. You will never be lost or bored when hiking with him! See what Andre himself has to say about the Kauksi-Aegviidu trail. The hike from Ähijärve to Aegviidu is the longest in the joint hiking event. It lasts for 20 days and is 627 kilometres long. In order to be able to complete the long route without having sore feet by the time you reach Aegviidu, this route is explored both on foot and by bicycle. The hike begins from the Visitor Centre of the Karula National Park, by Lake Ähijärv. 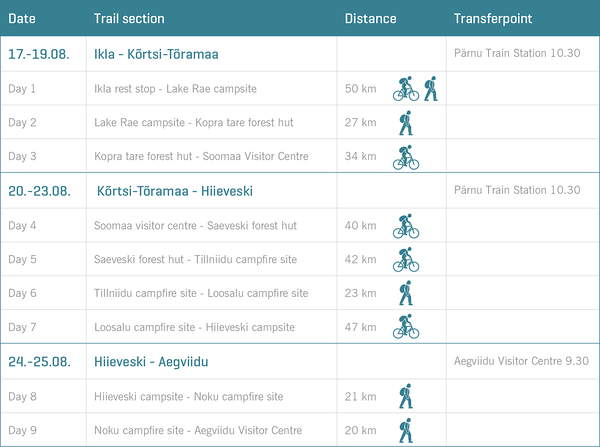 The trail passes all the well-known sights of South-East Estonia. Everyone who has not been to the Piusa caves or the Taevaskoja sandstone cliffs should definitely join this hiking group. A nature attraction that deserves a special mention is Tinaliiva loose sand area, which was used as a shooting ground for soldiers back in the 1920s and 1930s. Today, the large sand field is hidden in the middle of a thick, dark forest. The place is officially known as the Mustoja Landscape Reserve, but unofficially, it is called the Sahara of Setomaa. When going north from the south-east corner of Estonia, you come across the Võlingi springs. The springs that are hidden in the forest, in about one kilometre off the hiking trail, are definitely among of the most beautiful in Estonia. The path to the springs reminds of an adventure in a fairy tale forest: the boardwalk is hidden in luscious grass and surrounded by orchids and gnarled tree trunks that seem to be older than the Ülemiste Elder himself. The guide on this branch is Alar Sikk. For Alar, this is an unprecedentedly flat route, but at the same time, it is close to home. Alar is a quiet hiker who will not be the one striking up a tune by the campfire. However, he has a countless number of hiking stories to tell. The journey from Ikla to Aegviidu is exactly 300 kilometres long and takes nine days. The hike begins from the village of Ikla on the Estonian-Latvian border, first going along the coastline of the Gulf of Riga and then taking a turn into the large and peaceful heath forests of Pärnu County. As most of the trail consists of gravel roads, the majority of it will be completed by bicycle. One of the most peculiar nature attractions on the road is definitely the Laiksaare floodplain forest. The Rannametsa river, which flows through the forest and is more of a stream in the summer, overflows its banks during the spring flood and floods the entire forest area. What has emerged as a result of this is a haunted forest with lush and varied undergrowth but scarce trees. In the middle of the forest, a forest hut similar to a witch’s hut awaits hikers. The guide on this route is Kaidi Jõesalu. Kaidi is like a breath of fresh air with added vitamin C. Her cheerful character is sure to touch the entire hiking party and will help to overcome the lack of motivation on the way. The hike from Penijõe to Aegviidu takes eight days and is 212 kilometres long. It starts from the RMK Penijõe Visitor Centre, which is also the centre of Matsalu National Park. The biggest nature attractions both in Matsalu National Park and on the hiking trail are definitely the meadows of the Kasari River. This area with a size of about 4,000 hectares is an important nesting area for several bird species. In summer, one can see elks, roe deer, and moulting common cranes. Right before reaching Aegviidu, the trail passes Paunküla hills. These are eskers, some of which have turned into islands due to the construction of the water reservoir. The guide on this section is Maarja Mirjam Rajasaar. Mirjam is a true enthusiast who considers spending time in the nature both her job and her hobby. Therefore, she spends nearly half of the year outdoors. Her childhood playgrounds are also near the Penijõe-Aegviidu branch. Let us see what kind of childhood stories we will manage to get out of her!